Gringa Diaries: It’s the End of the World and I knowed it. Captain’s Log, Day 10: Currently 36 degrees F and wiiiiiindy, battling a chest cold, have walked among PENGUINS!, seen the end of the world by road and am now sailing towards a stormy grey curtain that hides the rest of it. Yup. Antartica. In crazy news, a 7.7 earthquake hit the coast of Chile, in fact hitting the town Chiloe where we had docked and had a lovely tour. The captain scared us a bit with the announcement over the intercom, saying there was a possibility of tsunami warnings, but that he would keep us informed. We didn’t even feel a difference in the swells, thank God, and the town reported no deaths, but it was a panicky few hours. Christmas Eve and Christmas Day were lovely – we joined a lot of people for a roaring piano bar singalong, hearing ‘O Tannenbaum’ in native tongue and missing my family and texting my mom that I promised to be home for Christmas next year. I’ve missed three of the last five, and five of the last five Thanksgivings. Oops. Bad daughter. Then the international ship crew performed in both English and their native languages – so earnestly and beautifully that I was moved to tears. And for the first time in my life, I attended a Christmas Eve mass. The Irish accent of the priest made it even more interesting. The next morning Gma and I had breakfast in our bathrobes and mimosas and watched Downton Abbey pretty much all day. 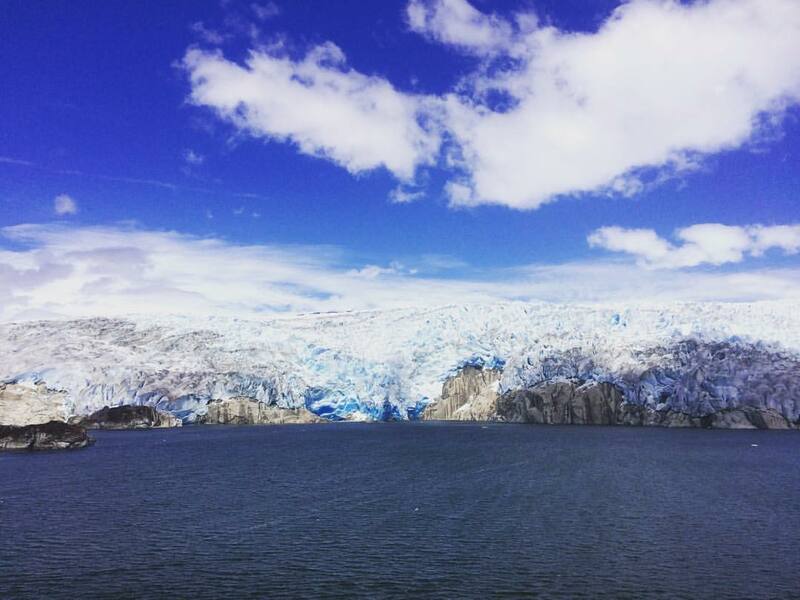 We had two days of scenic sailing – this included a HUGE glacier right outside our window, ice so cold and so blue it took your breath away to look at it, a few shipwrecks that I wished we’d just sail right on past, and some of the cutest lighthouses you ever did see. At one point we sailed between a red and green marker that designated the shallowest part of our journey – only 2 meters between the bottom of our ship and the bottom of the ocean. Over the intercom, they asked us to all jump on the count of three to lighten the ship so we’d make it through. And then we arrived at Puerto Arenas, where we would have our penguin encounter. 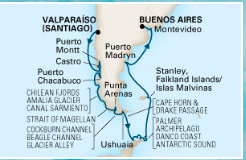 We were in the Strait of Magellan, and all I could think about was a report we did in sixth grade I think, about world explorers, where we cut out bodies on butcher paper and drew all these Spanish and Portuguese men and listed facts about their journeys. And then I thought about how I studied Spanish for so many years and then majored in Latin American politics and in Spanish in college and have known all these names and places for so long, and now I was finally here. It’s like being in a dream. We took a two hour ferry ride out to the island, which is a protected reserve, where about 100,000 penguins come every year to have their babies. We pulled into the beach and looked out and there it was. A tiny glimpse of heaven. Thousands of tuxedoed waddling angels, swimming in the surf, shielding their floofy chicks from the wind. Moms were anxiously cleaning their babies and some of them had a look like “Mom STOP people are taking PICTURES.” It was funny to see how interspecies some behaviors are. 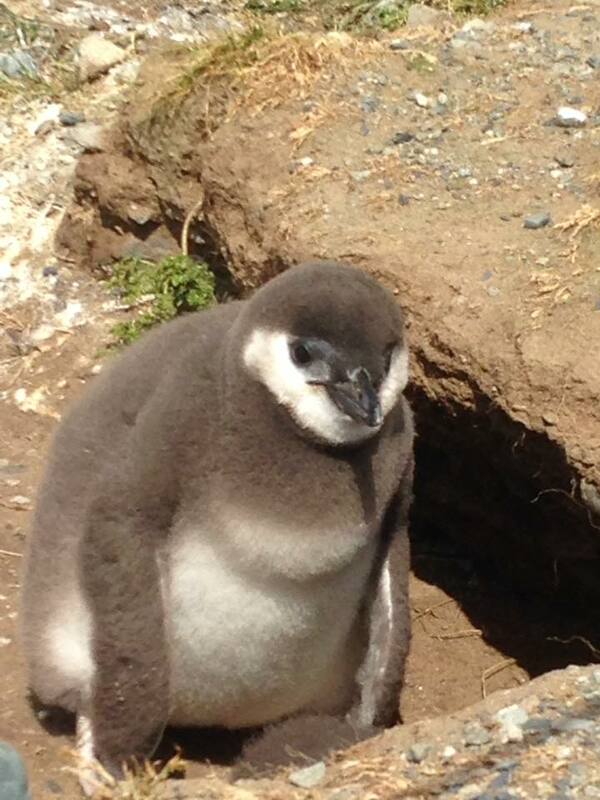 You could hear the babies “cheep cheep” and I saw a parent penguin waddle up the shore to feed their children. 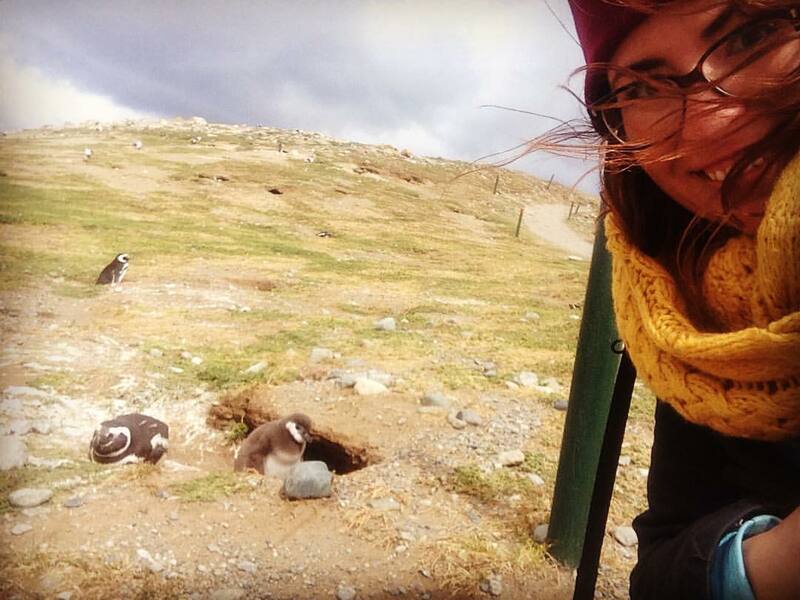 There was a mile stretch to walk around, each penguin cuter than the last. Because we don’t look like leopard seals, they were completely unafraid of us. I managed several animal selfies and thought longingly of the space I had cleared out in my backpack to bring one penguinito home, but in the end resisted even touching the floofiness. They were so cute I cried a little. It was simply magical. I kept wanting to sing “It’s a jolly ‘oliday with Marrrryyyy” and see if any of them would tap-dance with me. Mag ic al. 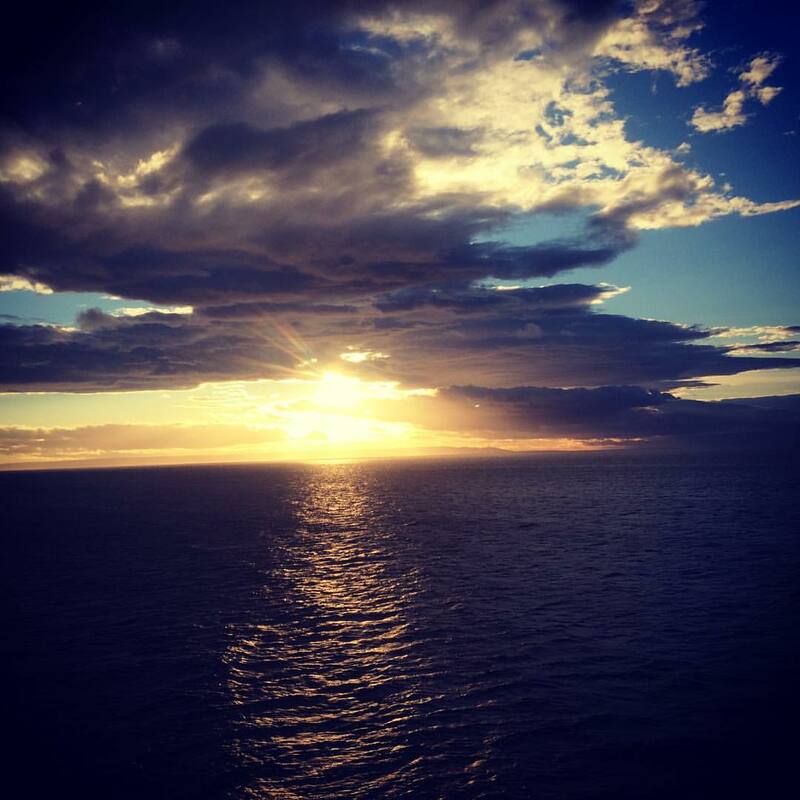 We had another long sailing day, navigating Chilean Fjords and you can’t help but wonder how anyone could have survived this voyage on wooden ships without modern navigation. Several times along this trip we pass small towns and pilot boats have to come out and guide our captain through the shoals and impending doom. How did they even know where they were going? All the ancient maps have spaces for sea serpents on them. Why would you even go?! I have so many questions. 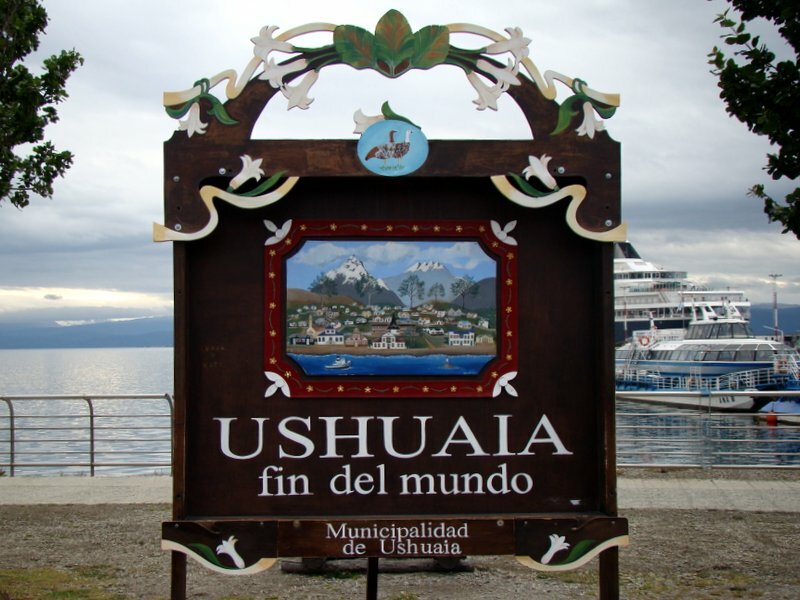 Our next stop was Ushuaia, commonly known as the end of the world. It felt lika very appropriate place to be as 2016 comes to a close . . . 2017 has to be better, right? The bar has been set so incredibly low . . .
Ushuaia and the Tierra del Fuego park hold the end of any driven road, marking the final stop of the Pan-American Highway, which I’ve crissed and crossed a few times on my journeys through the Americas. It was super cool to take a picture next to the sign, and then walk farther beyond it, to actually reach the last step of any marked path. 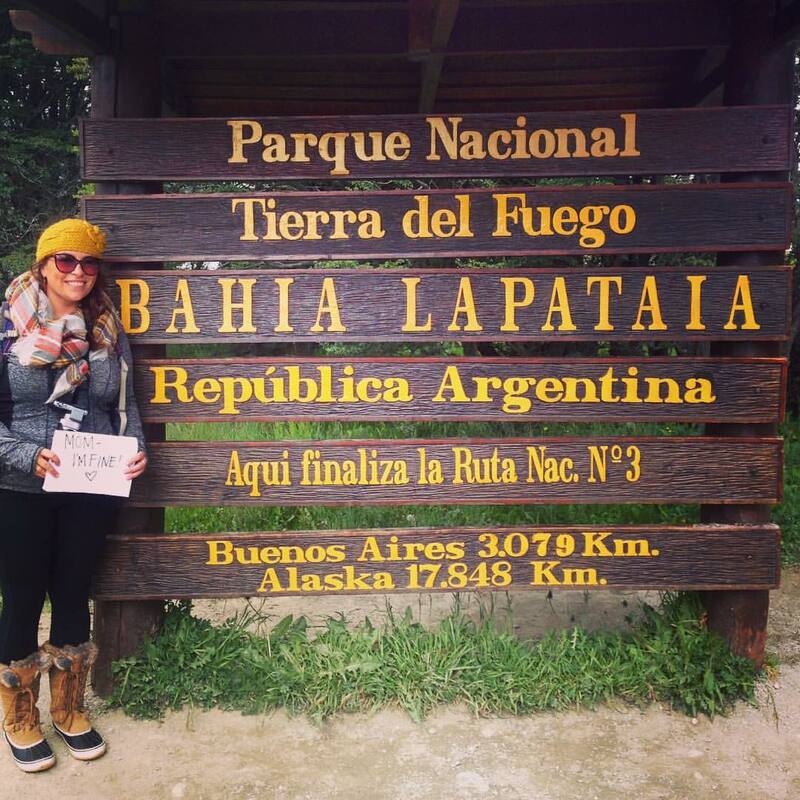 Tierra del Fuego is beautiful – the land is marked with lakes and rivers, peat bogs and hikers on treks of a lifetime. We drank a Beagle Channel IPA and bought overpriced souvenirs and Gma flirted with our tour guide, Coco. I resisted the urge to tell him what his name means in Portuguese. He was too cute. I’ve been very impressed with all our guides so far, and it’s nice to hear so much Spanish again. There are four Brazilians onboard that I’ve overheard and I’m tempted to make friends. I miss Rio. Ushuaia was populated by Argentine prisoners, and used to be a much more bustling port in the pre-Panama Canal days. Now it marks the last stop before Antarctica and a doorway into Tierra del Fuego and Torres del Pines, which were VERY impressive. We saw a boat at the dock that only holds 11 people, 22 crew, 2 submarines, and a helicopter to do intense exploring of Antarctica. How incredible would that be? Sometime this morning the captain congratulated us over the PA – we are now part of an elite group of people who have successfully navigated Cape Horn and entered the Drake Passage! Woo! Despite promising that we are in very good weather for the crossing, this feels like a lot of rocking and rolling to me. I keep thinking I’ll get back to the room and see everything knocked to the floor, but no. Our next six days are just sailing . . . and sailing . . . and sailing. We’re going to Antarctica! We won’t be able to actually get out and touch it, but we’ll be receiving some scientists from the Palmer station to tell us about their work, checking out the old whaling and sealing and wreck sites. There will be plenty of daylight to do so – about 19 hours a day. The water is so blue here I wish I could bottle it up and send you some. It has to be seen to be believed. And so much sky! I can walk the perimeter of the ship and see nothing but blue on blue. Not a ship or piece of land in sight. Lots of little birds I find myself worrying about for no reason – where do they sleep at night?! We’re so far from land! I’d love an albatross to perch on my verandah because I have a great riddle about albatrosses I love torturing people with. I’d love that for about five seconds. And then I’d freak out. our journey….we are at the bottom bit. Next land will be in six days – Faulkland Islands! I told them about the time I spent in Austria during my post-college graduation tour, how we skinny dipped everywhere we could across Europe, but couldn’t find anywhere to do so in Austria. We did however manage to find the only bar in the small ski town we were staying in, and it was called Hotel California, and I used a credit card for the first time and ordered drinks for all my friends. They wrote down their phone number and address on a piece of paper and said I could come visit anytime. Hans said I had to keep in touch, because he had already started worrying about me. The ship feels cozier and smaller with each new friend I make. If you haven’t heard it yet and you need to today, and if indeed this is the end of the world as we know it, I’m glad I know you. I’ve been taking lots of pictures on my nice camera, which I will upload January 17th when I’m home in Rio, and just a few on my phone to upload so mom knows I’m alive. The internet is 75 cents a minute, so I’m writing this whole blog out in MS Word first and then copying it over, counting the seconds I allow myself to use it. It’s probably for the best I can’t constantly post about this adventure. I’d flood your newsfeed and you’d hate me. And it’s making me spend a lot of time looking up and out and forward. Texting isn’t working, but if you comment on my blog post on Facebook, that’s about all I’m able to check at this point. And hey, like the Facebook page for the blog or subscribe to it if you want. Consider it a priceless, eternal Christmas present from you to me. loving your insights to this part of the world!